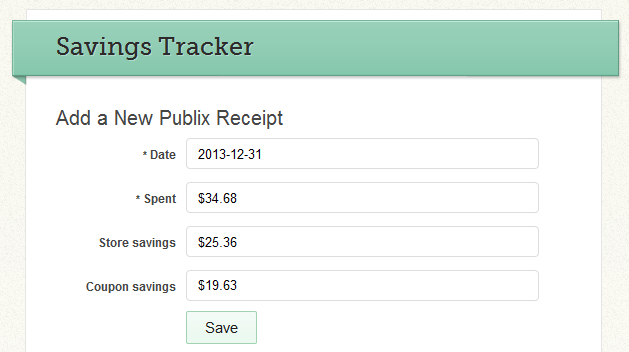 Home > Extreme Couponing 101 > Track Your Savings with the Savings Tracker! Track Your Savings with the Savings Tracker! 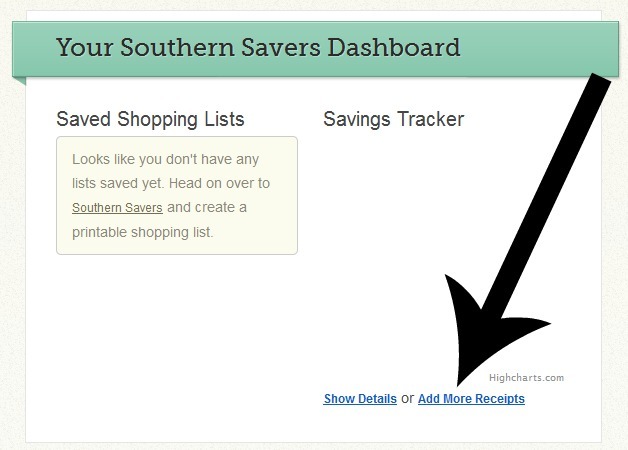 Have you tried out the Savings Tracker on Southern Savers? This was built to help keep us encouraged. You can see just how much you are savings and prove that it really is worth your time to coupon! You will need to log-in or create a FREE account to access the feature. Step 1: Create an account or log into your account. Step 2: After you log-in, you’ll be taken to the Dashboard. Click add more receipts. 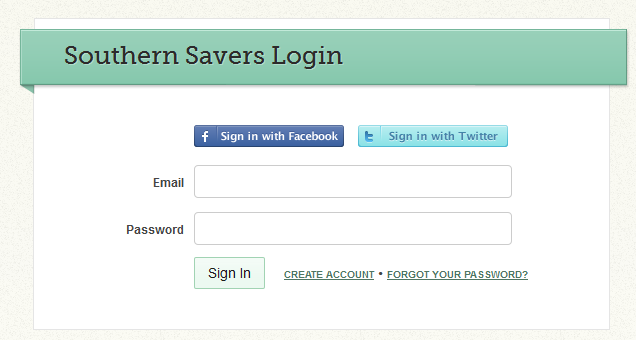 (You can also get here directly by clicking on Savings Tracker in the top menu bar that appears once you are logged in. 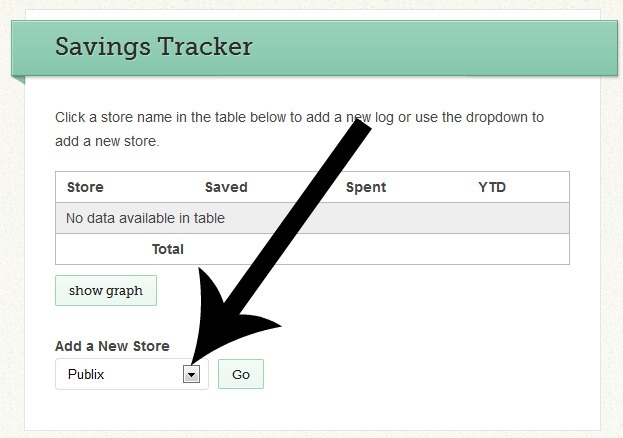 Step 3: Select a store from the drop-down menu and click go. Step 4: Enter the information from your receipt and click save. Step 5: Enter more receipts, view graphs, and more! Once you’ve entered some information it will show up here. 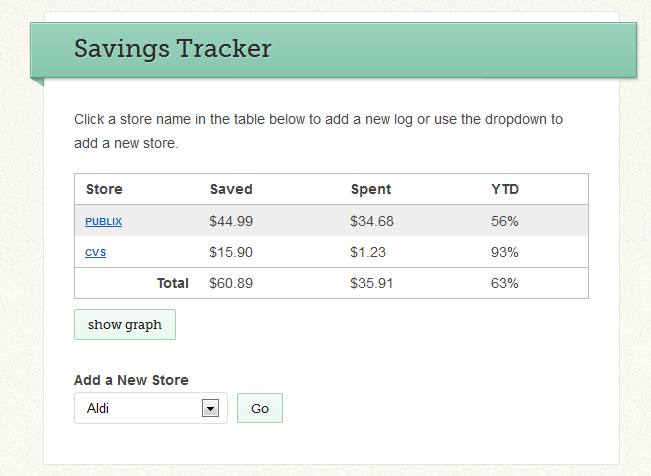 You’ll see your Month to Date and Year to Date Savings for each store and also your overall totals. You can also graphs if you are a more visual person. If you are a social butterfly, you can also share that savings on Facebook and Twitter after you track it. One of the joys of tracking over time is that if you have a bad week your prior trips help to even it all out. The goal here is save 50-60% off everything you buy, some trips will be much higher and some will be lower. Over time though you’ll really see your savings add up! Track your store sales based on the full retail price of items. We want to only grab sales and buying items at the right time is part of the work. If you buy gas gift cards or other items that don’t normally add into your grocery budget, don’t add those in to your total spent. Just use this to track normal purchases. There isn’t a way to enter notes (plus after a year of data you don’t want to have to come back and look at notes). 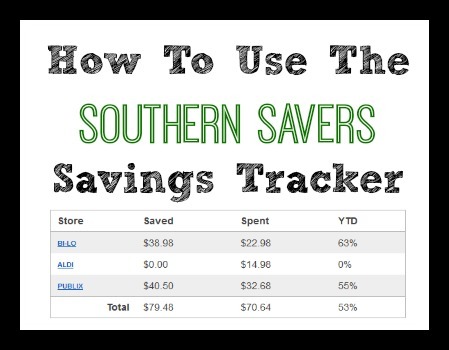 Track on the go with the Southern Savers mobile app!